I would love it if I could cover every single smaller release on the Xbox One, I really would. Ever since going solo I've cut back on what I would put myself through, with me only caring about numbers now as that is what publishers want if you expect to review things. Where old me would know about every game that was on the way as I would sit on the Internet 24/7, these days I tend to miss out on those little titbits of news when it comes to smaller releases on my console of choice due to doing more at home than before. It's becoming a regular thing now where I only get to hear about such games when loading up the Xbox store on the day of release and seeing a game I would have loved to type something up for, with the game I'm reviewing today being one that would have certainly fallen into that bracket. 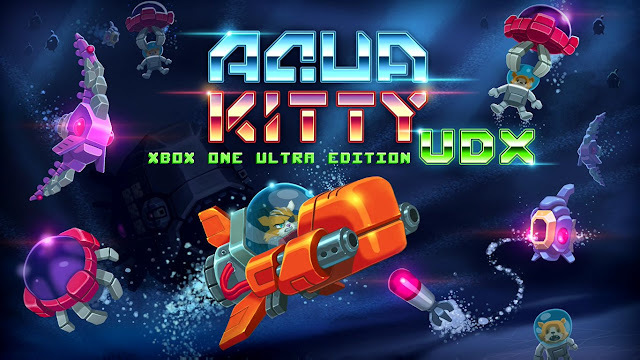 While having one of the longer titles on the Xbox One store, Aqua Kitty UDX: Xbox One Ultra Edition (Or Aqua Kitty as it will be known for the rest of this review) is somewhat of a very basic game underneath all those words. 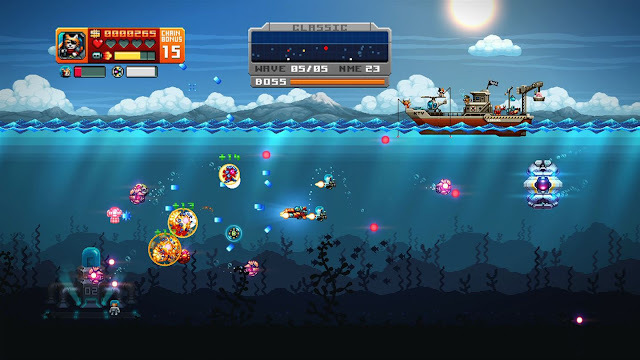 A simple 2D Shoot 'em up in which you have three modes to choose from which you can either play solo or 2-player local. The story behind the game sees the cats of the world run out of milk, and the only way to get their beloved drink of choice back in their lives is to go deep under the ocean and extract the full-fat milk which has been discovered way at the bottom of the ocean.........Oh video games, I do love your bat shi* crazy stories. There are three modes to choose from if you buy the game, with Classic, Arcade, and Dreadnought being those three modes on offer. Both Classic and Arcade feel the same game in all honesty, with Arcade having a little tweak to it if nothing else, and Dreadnought trying to offer something completely different. Before I explain that mode though I better explain the modes you will find yourself using more of first. In classic, your goal is to beat each level with each level having a set wave of enemies to it, while at the same time also having cats at the bottom of the ocean getting that milk who can be taken to the surface by one of the enemies you face. Each section also sees the last level of that section having a small mini-boss coming along, with these getting a lot tougher to handle along with the on-screen enemies the further you get into the game. This mode can be played in either easy or normal and with a friend if you wish via local play, but playing this as a single player I can't comment if this made the challenge of it easier or not when two of you were playing, but one would assume that to be the case. This section also has an extra mode in it too, with this mode called Infinite Expresso, which is easily explained as a mode that sees you trying to survive as many waves as possible without getting killed. 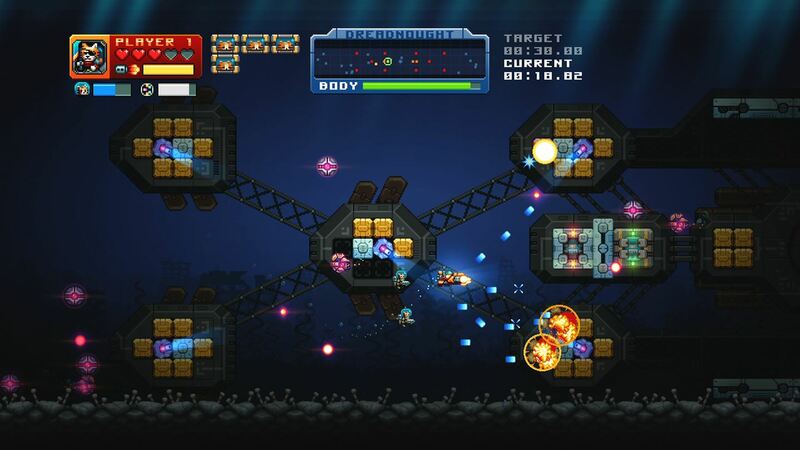 Arcade is more of the same when it comes to the whole scheme of levels, bosses, and how the game needs to be played to progress. This time around a death means get back to the start, with the only help this time around being that you can also collect gems as you play which allow you to unlock upgrades and health as you play. With not much difference between this and classic, I tended to find myself playing classic more due to having to play through the levels again if dying on this mode. Then we have Dreadnought, a mode in which you have to not only stay alive by killing and avoiding enemies, but also trying to take down an energy core of a structure on each level to progress. I absolutely sucked at this if I'm honest, something about being old and not having those fast reflexes anymore stopped me getting far in this mode at all. It's a good change from the previously mentioned modes though, as while classic and arcade offer the same experience deep down this at least offers something a little different. The last thing to bring up in this review is the control system and how it feels to play, with neither of these areas really having that much to talk about on. The control system is all rather simple with both the A & B button being the only buttons you need when it comes to your bullets, with the B button being the one that offers turbo fire over the standard shoot button found when pressing the A button. To aim either left or right you press the LB or RB button depending which way you need to face. Other than that is isn;t really much else to say. It handles how you would expect when playing a sub under water, with the game only throwing panic at you when either you're surrounded by enemies or one of the cats on the bottom are being taken away. Overall: For £6.39 I'd say you pretty much get what you expect from a shooter at that price. If you're a fan of the genre it ticks all the right boxes, but it certainly lacks in offering a good mix of modes if you plan on playing it for longer than an hour or two in one sitting. Other than that the time spent with this so far was an enjoyable one.